The April State Employment and Unemployment report, released today by the Bureau of Labor Statistics, showed most states are still plodding along with job growth sufficient to slowly bring down unemployment rates. A few states, particularly on the west coast, are showing more robust signs of improvement. At the same time, the states that had seen strong job growth from the oil and gas boom of the past few years may have cooled somewhat in recent months. Between January and April, 38 states and the District of Columbia added jobs, with Maine (+1.3 percent), South Dakota (+1.1 percent), South Carolina (+1.1 percent), Nevada (+1.0 percent), and Oregon (+1.0 percent) making the largest percentage gains. These states more than doubled the average pace of growth for the country over the same period (+0.4 percent). Oregon and its neighbor to the north, Washington, have had the second and third largest percentage gains in the country, respectively, over the past year. 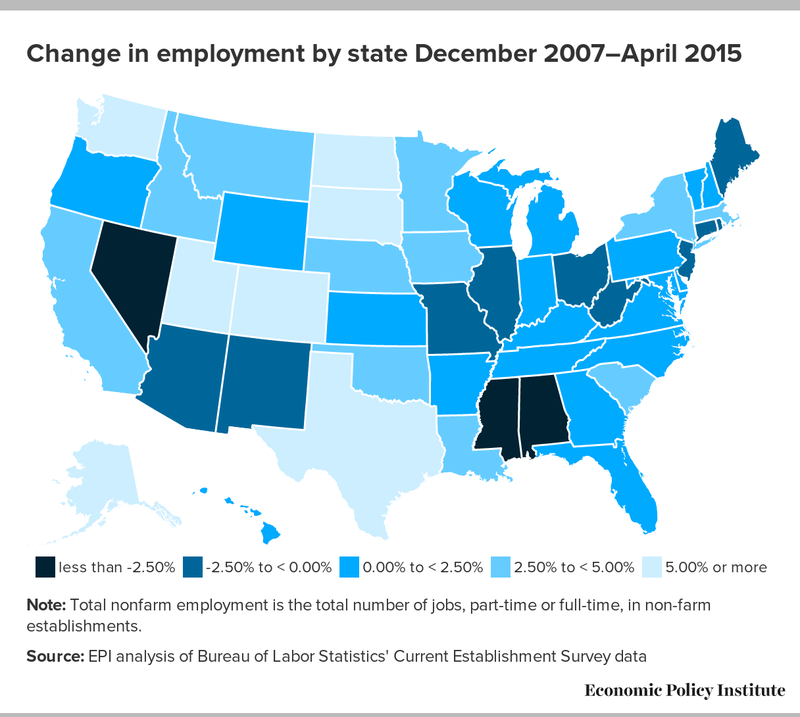 Over the same period, 12 states lost jobs, with the largest percentage losses occurring in West Virginia (-1.1 percent), Oklahoma (-0.4 percent), North Dakota (-0.3 percent), Wyoming (-0.3 percent), and Louisiana (-0.2 percent). The declines in Oklahoma, North Dakota, Wyoming, and Louisiana are likely the result of slowdowns in oil and gas production, following the boom that has fueled relatively strong growth in these states over the past several years. The decline in West Virginia is more troubling: West Virginia is the only state in the country that has lost jobs over the past year. 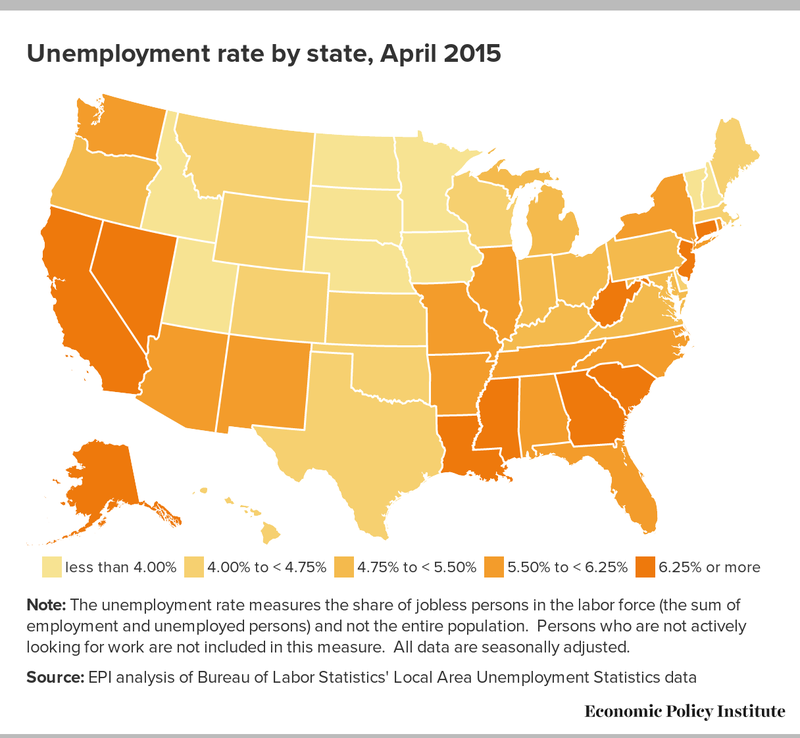 Unemployment rates fell in 28 states plus the District of Columbia from January to April. Oregon (-1.1 ppt), Michigan (-0.9 ppt), Washington (-0.8 ppt), California (-0.7 ppt), and Tennessee (-0.7 ppt) had the largest declines. The national unemployment rate fell 0.3 percentage points over the same period. At the same time, unemployment rose in 16 states, with West Virginia (+1.1 ppt), Alaska (+0.4 ppt), New Mexico (+0.3 ppt) and North Dakota (+0.3 ppt) having the largest increases. Now nearly 6 years into recovery, 36 states and the District of Columbia still have unemployment rates above their pre-recession levels. Although there are stronger signs of improvement in a few parts of the country, there is no reason to think we are anywhere close to a full recovery. Job prospects remain weak for too many job-seekers, especially for young high school and college graduates. Policymakers nationwide, and particularly those at the Federal Reserve, need to keep faster job growth as their number one priority.